The end of summer is near and that means everyone is going to try to get in a final few barbecue parties before the first snow. Okay, maybe it really is too early to actually reference snow, but what I'm getting at is that you need look at these next few outdoor parties with reckless abandon. Go out with a bang. 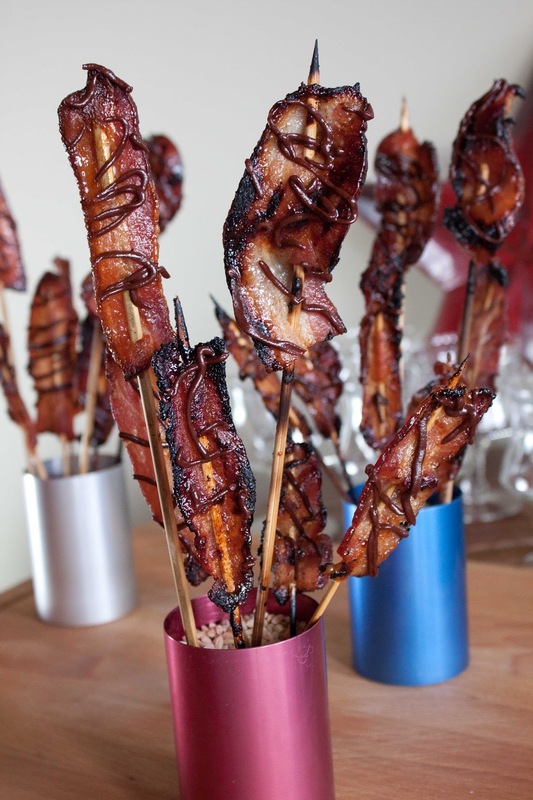 Throw caution to wind and get ready to WOW with bacon on a stick. 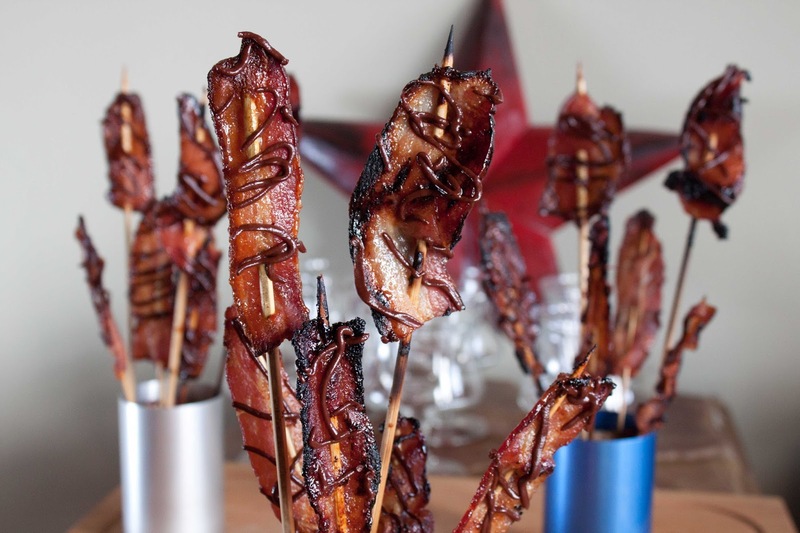 Bacon on a stick isn't exactly the healthiest thing I've ever made, but everything in moderation is key. A little maple syrup, a thick slice of bacon and a dollop of chocolate - it's an appetizer and a dessert all rolled into one. It's a bacon bouquet. It's food art. Fire up the oven or grill, warm the chocolate and tape your mouth shut so you don't accidentally eat all the bacon sticks before you get them to the party. 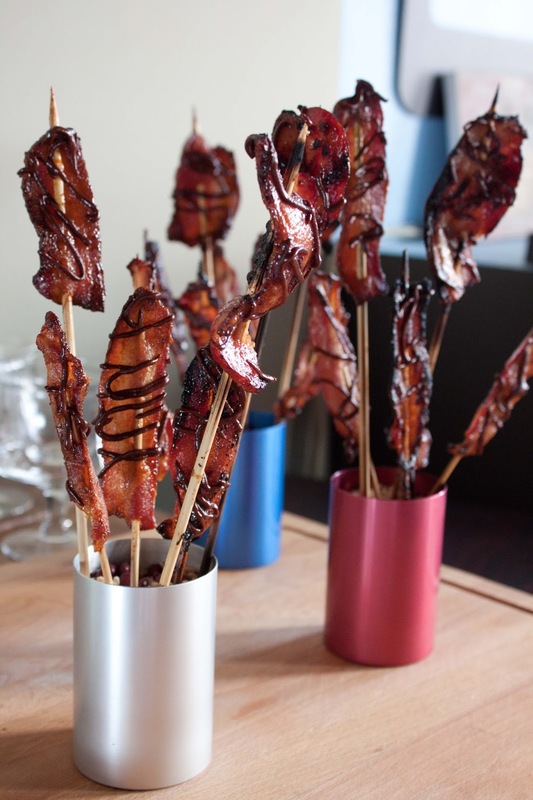 These Chocolate Maple Bacon Sticks WILL be the hit of the party. We need more meats on sticks. Fat and Happy Food Blog Tips and Techniques: I baked some of the bacon and some of it I grilled. I do like the smoky charred edges from the grilled version but it requires much more attention and it's difficult to not burn off the end of the stick- even if you have pre-soaked them. Start by soaking the wooden skewers in water for about an hour. Place a cookie rack on top of a cookie baking sheet lined with tin foil. Preheat the oven to 400 degrees. Whisk together the maple syrup, cayenne pepper and cumin. Cut the bacon strips in half, then thread each half onto a stick. Brush each side of the bacon with the peppered maple syrup. Place the threaded bacon onto the cookie rack, try to get the bacon to lay mostly flat. Place the bacon into the oven, cook until desired doneness is reached. I added a second brushing of the syrup for a little extra sweetness and spice about 15 minutes into the cooking process. Remove from oven and cool. 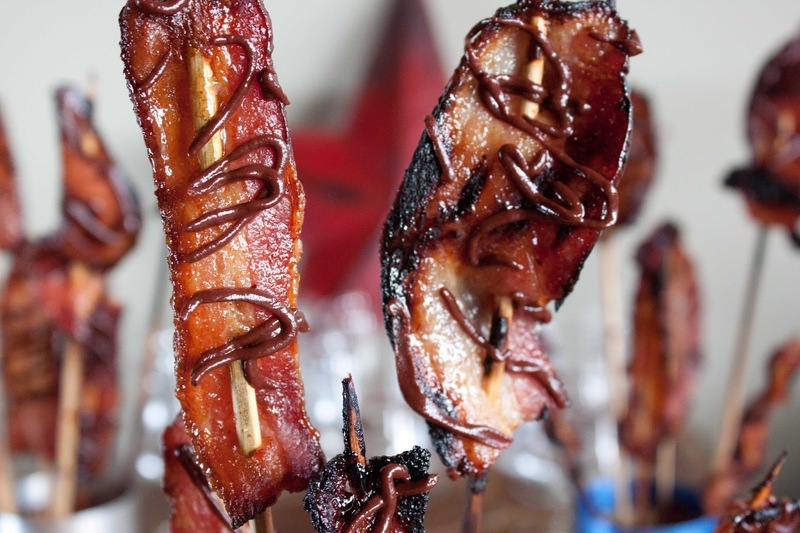 Warm the chocolate and then drizzle across the bacon. Allow the chocolate to harden before trying to arrange. To serve: fill cups or a deep container with dried beans, rice or small rocks. Stick the skewers in and enjoy! *I made two packages of bacon and there wasn't a single stick of bacon left over. Luckily I snapped a few photos inside because once these puppies were set down at the party they grew a crowd and were snatched up immediately. They were beautiful table decoration...if only for a moment. The Bacon Stick pairs well with all drinks!